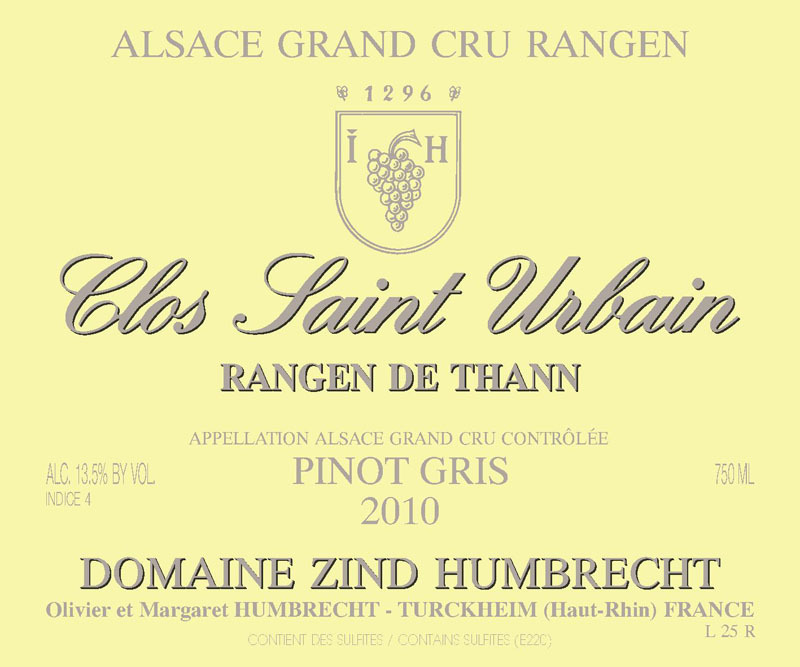 Like many other vineyards in 2010, the Pinot Gris grape developed some noble rot while the Riesling stayed very healthy. The Rangen is located in a late ripening climate, benefiting from an outstanding exposition to the sun (90% average steepness facing South). The combined effect of the river Thur, which brings humidity and solar reflection, and the rocky soil that catches the sun heat late in the season explain the quick development of noble rot in this vineyard, especially in the lower part, closer to the river. The Pinot-Gris started flowering slightly earlier than the Riesling and therefore coulure was more important. The 2010 fermented quite fast in just less than 3 months, but then settled for a balance with important residual sweetness. 3/2012: just like the Riesling, this wine develops huge Rangen aromatics: flint, smoke, minerals, almost peaty (!) with more classic ripe white fruits. The nose doesn’t allow the taster to guess the intensity of the palate. The mouth feel is dense, long lasting and full of mineral flavours. One wouldn’t call it powerful or heavy as the acidity of the vintage prevents any heavy character. The sweetness is well present and deserves, today, an indice 5, but some ageing will see the structure take over. I expect this wine to age a long time.